I am going to be blogging about iPods, iPhones and iPads in the classroom soon. I am going to share with you how to get them in your room free. 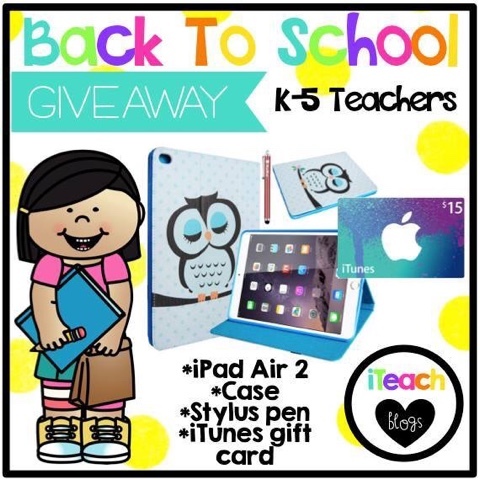 Well, the iteach blogs are giving away a FREE ipad2, case, stylus, and gift card to one lucky winner. I never try for giveaways. I feel like I'll never win. Well, someone has to. We have it all packaged up and ready to go. Why not try and be that person. If you win and only have one, I'll give some ideas on how to use it!!! WE are excited to have 20 ipads in our classroom this year. I have had a lot of training on some great apps for students to use to really inspire their creativity with writer's workshop and different ways to publish their work. WE are looking for ways to connect with other Ipad teachers too. So I will definitely be checking back for some great ideas. I really want to hear how you format your Math block each day! Please share!